Eureka Pumps is a supplier of API610-compliant centrifugal pumps and related systems. As an original equipment manufacturer (OEM), the company develops unique pump technology using more than 40 years’ experience in the oil and gas industry. Eureka also delivers spare parts and offers field services worldwide. The Eureka process pumps comprise heavy-duty API610 centrifugal pumps developed for the oil and gas industry. They cover various applications such as hydrocarbon, produced water, utility, cooling and heating pumps. The stuffing box accommodates both single and double-cartridge mechanical seals. All material grades are available. The company’s firewater system includes a driver, pump and control system and is designed for operations in safe and hazardous areas. The containerised design meets 85dBa noise requirements and can be A60, H60 or H120 fire-rated. The API610 pumps and systems are in accordance with NFPA 20 guidelines. Eureka’s submerged electric motors are water or glycol-filled with static pressure maintained from a deck-mounted header tank. No fireproofing is required and the motors cause no harm to the environment. Motors are available in all voltages up to and including 11kV. Eureka seawater lift pumps consist of API610 heavy-duty centrifugal pumps that have been delivered to the oil and gas industry for more than three decades. The product range comprise line shaft, electric submersible or dry-mounted pumps in seawater-resistant materials. Eureka continuous dense (CD) vertical turbine pumps feature a robust design, long service-life and high-reliability. The pump capacity range varies from 500m³/h to 10,000m³/h and heads up to 250mlc. 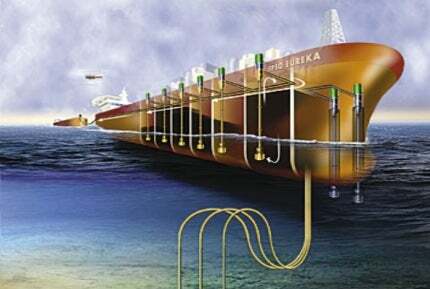 The Eureka electric-driven cargo oil export system provides optimised HSE values such as high system efficiency, low energy consumption, low noise and safe maintenance. The deep well system is available as a centrifugal, single or multistage product with a lubricated shaft-type line. The distributed pump arrangement has one deep well pump in each cargo tank and each pump can have a differential pressure of up to 22bar (g) and there are no limits on capacity. The Eureka electric deep well pumps feature explosion-proof, deck-mounted motors. Booster pumps can be incorporated in the system for higher pressure and other operational scenarios.